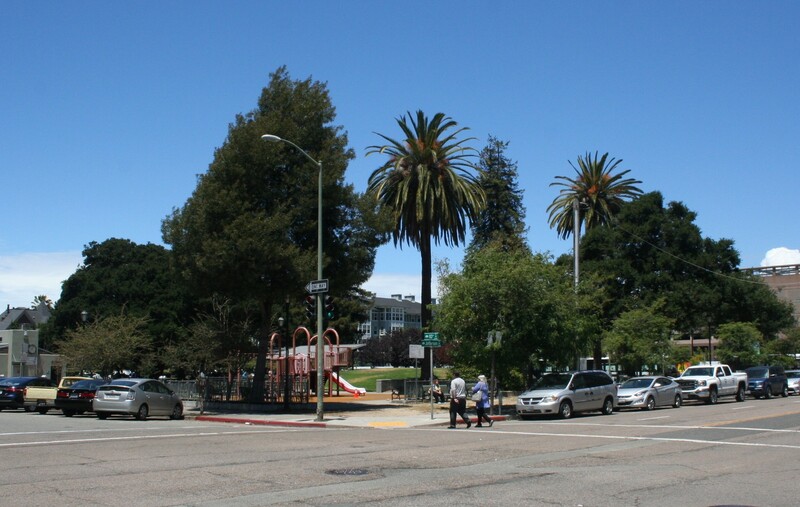 Residents and business owners around Lafayette Square in Old Oakland are up in arms after many learned last week that their beloved park may soon become a de facto bus terminal. A proposal from AC Transit for Lafayette Square would surround three sides of the park with buses. e for bus drivers in-between routes. The planned changes is part of AC Go, the department's largest service expansion in their history, which begins on June 26. But some residents and shop owners say they were not given notice of the impending parking changes prior to this past Monday. Now, they’re concerned that buses will bring noise and air pollution to Lafayette Square and block sight lines into the park, which will reduce vigilance and increase crime. According to neighbor Wes Radez, AC Transit told him that the decision to park buses at the park was made by staff only and without public feedback. “They’re building a miniature Transbay Terminal in the middle of Oakland and they’re treating it like they’re removing a few parking meters,” he complained. But AC Transit says it gave sufficient notice to several businesses and residents directly across from the affected parking spaces earlier this month. One side of Lafayette park, along 11th street, is already used as a bus layover, AC Transit spokesperson Robert Lyles noted. “Before we activated any of this, it was legislated by our board. There was extensive outreach to the communities that would be affected,” Lyles explained. According to the notice letter sent by AC Transit on June 7, the park was chosen in part for the presence of public restrooms available to bus drivers. There’s currently a bus stop at the corner of the park, along Martin Luther King Jr. Way, as well. But Ron Wolf, chairman of Old Oakland Neighbors, says he seldom sees it used. “It’s maybe convenient for the bus drivers to go to bathroom while waiting for next bus to start, but there’s gotta be a better reason than that,” Wolf said. While the park comes alive at times, such as on Earth Day, neighbors say it’s earned a troubled reputation as the site of crime and occasional drug deals. Some residents have grumbled that the city has done little to help relocate the homeless population that lives in the park. According to Lyles, a public-notice period for the plan will remain open through tomorrow, June 21, and no immediate action will be taken along Lafayette Park. He described the letter as a notice for public input, rather than an announcement of plans. Will Berkeley Cut A Deal With Airbnb Or Vote To Regulate Short-Term Rentals?